Religious freedom fighters of WhiteManistan, unite! Only a day after Arizona governor Jan Brewer vetoes Hate-the-Gays in Arizona because it would be bad for business and a Texas judge strikes down a forbid-gay-marriage law in Texas, the Grand Old HateMongers vow more vigorous efforts to burn witches “continue to press for additional legal protections for private businesses that deny service to gay men and lesbians, saying that a defeat in Arizona this week is only a minor setback and that religious-liberty legislation is the best way” to hate gay people. It is the height of religious intolerance, anti-American and unwholesome to not allow WhiteManistan to burn witches refuse to do anything for gay people if their religious beliefs requires them to hate and punish said gay people. As WhiteManistan tries to enact Uganda lite, in its honor, Autotune Eat da Poo Poo. “Religious-freedom measures that could have implications for gay rights are pending in Kansas, Mississippi, Missouri and Oklahoma,” read the Washington Post this morning. The pure milk of the Culture of Lickspittle. The Texas Niagara Falls of race-baiting slurs and misogyny will stop. For now. Ted Nugent is to the hospital for total knee replacement. He uses a cane, put aside when he takes the stage. Nugent was a candidate for a Rascal. Nugent suffers from kidney stones. His knees are gone from bone grinding on bone and the resulting osteoarthritis. The mainstream media, despite its daily coverage of his colorful character for the past two years for the sake of clickbait, has declined to speak of this aspect of the man’s life. Nugent is not the iron man he likes to paint himself as. He’s 65. He has health problems. And today in his column at WorldNetDaily, after a week or so of being at the center for a media maelstrom for calling the president a subhuman mongrel, Nugent announces he will be taking a break as he undergoes double knee replacement. As you read this, yet another little Nuge update at WND.com on this lovely day of our Lord, Feb. 26, 2014, I am gone with the wind, out cold, bonkers, comfortably numb, zapped, schnookered, boogered, out of pocket, off the grid, anesthetized, beyond the zone, almost Ozzy-like. And what, you may ask, is so positive about this painful procedure that knocks me flat on my 65-year-old a–? Well, beyond the truism that what doesn’t kill you makes you stronger, and beyond the joyful thoughts of being back in the saddle of that legendary Ted Nugent athletic mobility, this rare down moment in time will force me to temporarily disengage from this putrid, tragic culture-war media debate that rages on across the land on a minute by minute, hour by hour, day after day nonstop basis. “You see, not only will my legs become more powerful and reinforced for the rock ‘n’ roll and bowhunting adventures that lie ahead in my indefatigable American Dream, but after this brief respite and forced rehab, a certain electrifying soul cleansing and spirit re-invigoration will surely transpire, increasing the mental, physical and spiritual firepower of our favorite MotorCity Madman,” Nugent continues in one of his now bog standard run-on sentences. Double knee replacement is tough surgery. “Full recovery will take 3 months to a year,” informs the National Institute of Health. If Nugent wished to be even potentially ready for his summer tour this year, now was the drop dead last moment to have knee replacement done. He still might not make it back in time. Summer, I’m predicting, will be for a vacation. Total knee replacement patients are put on their feet quite early after the procedure so that the joints do not stiffen. Physical rehab takes a good deal of time. Pain is considerable so control of it is important. High impact in daily life, tennis playing, jumping off of even small guitar amplifiers, pretending you’re a young man, are pretty much out. The problem lies in the nature of the prosthetics. They can loosen or shift. On CNN earlier this week, Nugent appeared to barely hanging onto composure. To me, anyway. This, as a very stressing future, may have had something to do with it. Ted Nugent needs a break. So does everyone else, from him. Perhaps it will be positive. For CNN, Nugent made idiotic claims about going along on law enforcement missions, raids, with the DEA, ATF, FBI and Texas Rangers. These are claims he has made before but it’s not worth looking them up. They’re obviously lies. Politifact went to the trouble of calling the agencies. It dubs Nugent a liar here. But we already knew that. The most seen faces of BitCoin, until the Mt. Gox failure and replacement by the Waiting for BitCoin Godot guys. Source: The New York Times, today. What makes the Ponzi Twins so swank? It’s all that money in their BitCoin tank! And how did the Ponzis get so swank? Who knows, buddy? Don’t be a crank! Even Nobel laureates in the Manhattan Project never approached the worth of the Ponzi Twins. A US senator is asking the federal government to take this remarkable step: completely ban Bitcoin. Manchin, who is a member of the Senate banking committee, suggested in the letter — titled “Manchin Demands Federal Regulators Ban Bitcoin” — that a complete prohibition was appropriate because Thailand, China, and South Korea have already enacted severe restrictions or bans of their own. It’s unlikely that the Federal Reserve and the executive branch possess the statutory authority to prohibit Bitcoin without a new law enacted by Congress and signed by the president — making Manchin’s letter something of a publicity stunt. No one listens to Joe Manchin. More unintentionally humorous, he’s the famous Senator from a state where most of the people have little or no money: West Virginia. I read your [Wall Street Journal] article today. I feel deceived by you. You requested to speak with me, so I took time out of my day to do so. We talked for 20 minutes, during which time I conveyed to you my sentiments about the Bitcoin ecosystem and the matter of MtGox’s collapse. My message was unambiguously a positive one. I didn’t focus whatsoever on the personal funds I lost at Gox. Indeed, the impetus for your call was my heartfelt post on Reddit. Is that really the takeaway you had from our call and from my letter? Is that your idea of journalism? Did I come across with the sentiment of a despairing investor whose confidence has been rattled? It seems you were happy to completely ignore my sentiments, preferring instead to cherry pick the one fact that is least important, in order to paint a narrative that Bitcoin’s biggest problem is that it’s not “regulated.” I didn’t expect you to quote everything I said, but should you not have maintained at least a modicum of fidelity to my message? I have dedicated my life to building and supporting the Bitcoin project. I don’t give a damn about the money I lost at Gox. That’s not important. What is important is that Bitcoin is resilient and enduring, and will continue to grow and change the world for the better. It is a story of human progress through technology. It is a story of the good seeping into the cracks of a corrupted financial system. It is a story of passionate people struggling against all odds to remedy the calamities brought down upon society from the most potently misguided people and institutions on Earth. Next time you spend your efforts casting a pall over this cause, please don’t ask me to contribute mine. PS – I will be posting this letter openly on Reddit. I will post your reply if you’d like. And if I do, I won’t cherry pick the most misleading points of it, and I will spell your name correctly. Mr. Vorhees, it is said, lost over $300,000 in BitCoin on Mt. Gox. A number of mainstream merchants recently have started accepting bitcoin for payment, including online retailer Overstock.com, the Sacramento Kings professional basketball team and online dating site OKCupid. The Mt. Gox mess hasn’t changed the enthusiasm of Overstock.com, which began accepting bitcoin for payment in January. “If we didn’t use greenback dollars because a bank or two failed, the greenback would never have gotten off the ground,” said Jonathan Johnson, executive vice chairman of the discount online retailer. Whole Foods has two stores in Pasadena. One on the Arroyo and one on the east side of town at Foothill north of the highway. The Arroyo store announced a job fair on Monday on Facebook and a placard at the franchise on Foothill was seen on Sunday by a friend. You were to upload your resume to the corporate website and come by the store between 9 and 1 today. The store was overwhelmed by job applicants. The three level parking garage was filled and job-seekers played musical cars in the lanes hoping for a lucky break. I got such a break and went into the store. There was a line of at least 150 people. More were waiting outside. The store had to put up a sign. You would not be seen without an appointment. The drop by/walk-in plan was cancelled. I had no appointment. The Whole Foods website advertised two openings at the Arroyo store, both for part-time work, one in the meat department and one as a dishwasher. People milled around as staff tried to organize those in the crowd who did have appointments. As I drove out, a line of of cars snaked into the garage. There is never that kind of crowd at Whole Foods before noon at the middle of the week. It’s a good store. So is the one on the east side. It has always seemed a pleasant place to work. The employees have their own unorthodox cool that sets Whole Foods apart from most other places in Pasadena. The only rival, Trader Joe’s, is equally good, although for a much more frugal job, a niche it fills perfectly. Excuse please, my mind wanders. If you like, you can throw a few coins in the misery jar. For Arizona, one of the red beating hearts of WhiteManistan. Take the Super Bowl off them even if the anti-gay law is vetoed. You know they’re not sincere, They just regret the outrage directed at the state. From three years ago. Nothing has changed. If anything, the hatred is more virulent. It’s all in there. Ted Nugent, punish gay people, global warming is a hoax, Darwin’s theory of evolution is a joke, the hard concrete of the proper life in Republican WhiteManistan. Enact law that strikes at everyone not like you. This under the reasoning that they don’t like us in California, anyway. Nobody wants to eat food in a group where no one likes each other. It’s bad for the digestion. Mt. Gox is gone, or almost so, reads the news. Rumors about the possible collapse of leading Bitcoin exchange Mt. 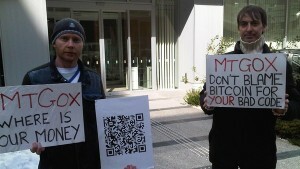 Gox are sending shock waves through the community that has embraced the virtual currency. Amid radio silence from the company, users are attempting to sort through conflicting signals that the company has shut down or that it is being acquired and possible relaunched …Ryan Galt, a Bitcoin blogger, wrote a post expressing his fear that this could be a fatal blow. That would be the Ryan Galt, great great grandson of John. Meanwhile, over at Ponzi Twins Central, the Winkdex provides evidence that BitCoin hoarders are desperately trying to keep the price of the currency propped up. Either it’s a camera distortion or there’s something wrong with Ted Nugent’s mouth. One corner, his right, doesn’t work quite as it should. Nugent starts coming apart at around six minutes, losing it when CNN’s Erin Burnett runs a tape in which he elliptically calls the President a chimpanzee. “I have not a racist bone in my body … I’m a black guitar player from Detroit, get over it!” he rants. Credit a host who put someone, now nearly hysterical and visibly mentally ill, on the spot for about 13 minutes. The slurs come out of him too quickly now, he can’t stop himself. CNN finally realizes it’s hosting a psychopath. Well over a quarter of a century ago I was always able to find Hutckinson’s recipe for abrin [and ricin] at the end of a telephone line. With the squeal of a US Robotics modem you would find it archived, along with lots of other alleged means to easy mayhem and malice, on bulletin board systems run off PCs in the bedrooms of young men. With regards to the poison and other informations from the computer underground, what it was called back then, not much has changed. Keep it in mind, it will have some relevance later. In the last few years anti-terror training has moved from drills centered around Muslims to those involving domestic terrorists. A dead science teacher, weapons of mass destruction, first responders in hazmat suits and the Ohio Army National Guard all near the Municipal Stadium in Portsmouth, Thursday. There’s no cause for alarm — this is just a drill! The mock disaster training exercise is being done with Scioto County first responders and the Ohio Army National Guard 52nd Civil Support Unit. The make-believe scenario is timely. Two school employees who are disgruntled over the government’s interpretation of the Second Amendment, plot to use chemical, biological and radiological agents against members of the local community. On hair-trigger over being potentially painted as domestic terrorists, gun rights supporters used the Freedom of Information Act to pry loose training documents on the incident. The papers show a theoretical plot in which a disgruntled janitor in the Portsmouth School District cooks up some sulfur mustard and ricin, dispersing the former in a plot which caused minor burns. Ricin was put into the school lunches of children, sending many to the hospital with “flu-like” symptoms. The scenario shows the janitor inspired by William Pierce, a famous American neo-Nazi known as the author of “The Turner Diaries,” America’s foremost example of race hate and government overthrow fiction. Pierce died a number of years ago but his book was a bestseller within the neo-Nazi violent right underground. Timothy McVeigh was one infamous domestic terrorist influenced by it. The ricin recipe was also reproduced in the documents. It is illustrated as originating from the “Second” Temple of the Screaming Electron 2 website. I could not find it on TOTSE2, so it is possible that for the drill, something was put together that looked like the chat board. The original Temple of the Screaming Electron, although it no longer seems to exist, is archived in more than one place on the web and the mirror includes its old ricin recipe. The ricin recipe was a procedure bowdler-ized from far right kook Kurt Saxon’s Weaponeer and The Poor Man’s James Bond where it was attributed to someone named Punk Rock Girl. Or maybe it is there at TOTSE2 and my search-fu was not strong enough. Or perhaps it was taken down. During the [anti-terror] sweep which netted the alleged ricin cell, one young man was arrested with a copy of the ricin recipe downloaded from the Temple of the Screaming Electron, which is where Google will take you if you punch in “how to make ricin” and then click the “I’m Feeling Lucky” tab. He was subsequently released. The person apprehended turned out to be a researcher with the wrong kind of name. Over a quarter of a century ago, The Temple of the Screaming Electron was a bulletin board system hosted on a PC at the end of a telephone line. It archived computer virus source code, hacking files and, of course, things like the ricin recipe from self-published pamphlets authored by the violent right, then called anarchy files. It was later migrated to the world wide web where it lasted, I’m guessing, for about a decade. drawn as someone striking back in retaliation against perceived effort to change or eliminate the 2nd Amendment. However, in terms of motivation, how poisoning young children with ricin at lunchtime would symbolically be seen as having something logical to do with 2nd Amendment rights escapes me. If recent history is a guide, domestic terrorists have planned to attack government workers and installations. Continuing, domestic right-wingers were recently been convicted in a ricin plot. One such group was puckishly referred to as the Georgia Ricin Beans Gang in 2011. Two members of that group were recently convicted by a jury in 90 minutes for conspiring to attack the government with ricin. Two others had previously taken guilty pleas on weapons offenses. And a few days ago the FBI arrested three more men who were allegedly conspiring to attack the government with pipe bombs. Three Georgia men tried to buy pipe bombs and other explosives and discussed attacking power grids, water treatment plants and other infrastructure in a plot to incite other militias to fight the federal government, authorities said. Between Jan. 23 and Feb. 15, the three men participated in online chat discussions about carrying out an operation against the government in February, according to a written statement from an FBI agent. The online chats were monitored by the FBI. ‘‘Peace encouraged members of the militia to review guerrilla warfare tactics, small unit tactics, accumulate supplies and prepare family,’’ the agent’s statement says. In a recorded phone call on Feb. 8, an FBI source told Peace he had a contact who could provide the materials the men sought. Peace said during the conversation, ‘‘… if he can hook us up with say 12 pipe bombs that will be sweet,’’ according to the agent’s statement. A second FBI source told agents he had a conversation with Cannon on Feb. 8 during which Cannon said the group planned to ‘‘start the fight’’ with the government by sabotaging power grids, transfer stations and water treatment facilities to create mass hysteria, the agent’s statement says. That would push the government to declare martial law, which would push other militias to join the fight. The FBI arranged for one of the informants to supply the men with a dozen dummy thermite bombs, at which point they were arrested. As mentioned last week, it’s quite clear Homeland Security and the FBI monitor networks for this kind of thing. And the right is a bit perturbed about the Oho anti-terrorism drill. Why were the Winkelvoss twins able to become Bitcoin experts? Because they had the money from the upper class and sucking cash from Zuckerberg, enough to at least buy up 1.5 million and somethings worth of Bitcoins. And why are they successful at getting others to invest in their consulting services, hedge funding and so on? 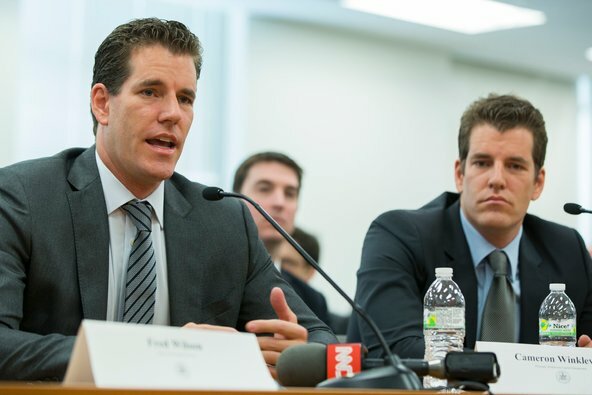 Because they are famous to semi-famous for being famous or semi-famous and people see the money sloshing in news articles in which the Winklevoss twins appear. So the Winklevosses are wealthy because they were born to it and became adept at siphoning big money from large pools of it as the opportunities are presented when it splashes around. Bitcoin, which is for hoarding, gaming the system, deception, chiseling and speculation, is a perfect match with them. Stock traders have the Standard & Poor’s 500. Bitcoin bettors will have the Winkdex. There are already a bunch of these things. But they are not called Winkdex and perhaps lack the slick cachet of the Ponzi Twins. If you have the old BitCoin client server and wallet for the PC, you know you can contribute to the BitCoin network. You can give it your electricity and resources to help keep track of worldwide BitCoin transactions in exchange for nothing. The BitCoin wallet will gladly chew up electrons for you as your virtual crypto-currency wallet sits empty, not even inhabited by a virtual moth. Can data centers tap unused server capacity to mine for Bitcoins? The question occurred to the team at the online backup service iDrive, which performs most of its customer backup jobs overnight, leaving its 3,000 quad-core servers idle for much of the day. So the company ran a test with 600 servers to see whether Bitcoin mining could become a secondary revenue stream. The result: running Bitcoin mining software on those 600 quad-core servers for a year would earn about 0.43 Bitcoin, worth a total return of about $275.08 at current prices on major Bitcoin exchanges. “Its a waste of time, so any other company thinking about mining with their infrastructure, learn from us,” said iDrive’s Matthew Harvey. Yes, the blog now accepts BitCoin. Please don’t make me so desperate that, like Jesse Korff, I start up a black market for exotic poisons on onion-network routers to just get a BitCoin by selling doses. All I want, before I die, is to go home to Allentown and be able to use BitCoin to buy a sub sandwich on Hamilton Street.